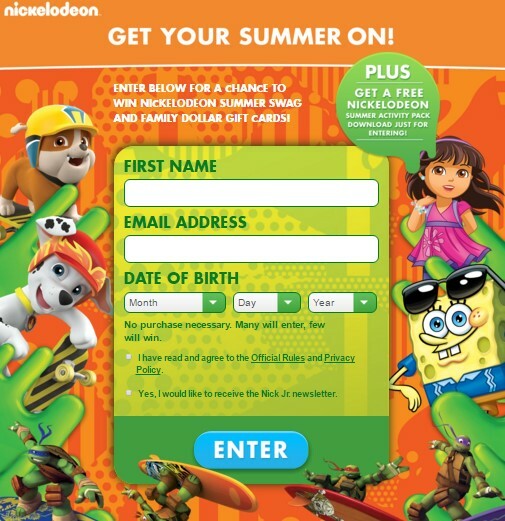 Family Dollar has teamed up with Nick and they want you and the kids to have a fun-tastic summer so they're offering you a chance to enter once to win Gift Cards and great Nickelodeon prizes! Grand Prizes (10). Ten (10) grand prizes (each a “Grand Prize”, collectively the “Grand Prizes”) are available to be awarded in this Sweepstakes. Each Grand Prize consists of a Nickelodeon-themed prize pack composed of the following items: (i) one (1) “Teenage Mutant Ninja Turtles” (“TMNT”) skateboard (approximate retail value [“ARV”]: $18.00); (ii) one (1) “PAW Patrol” Swim Set, including snorkel, mask, flippers and kickboard (ARV: $16.00); (iii) one (1) “PAW Patrol” Beach ball (ARV: $5.00); (iv) one (1) “SpongeBob SquarePants” (“SpongeBob”) 965572v1 3 Goggles (ARV: $7.00); (v) one (1) TMNT Sunglasses (ARV: $4.00); (vi) two (2) (one adult size and one kids size) Nickelodeon programming-themed (TMNT, PAW Patrol, SpongeBob or Dora The Explorer, Sponsor’s determination) T-Shirts (ARV:$20.00); (vii) one (1) “Dora The Explorer” Beach Towel (ARV: $11.00); (viii) one (1) TMNT Inflatable Tube (ARV: $6.00); and, (ix) one (1) gift card which can be redeemed for a Fifty Dollar ($50.00) purchase at a Family Dollar retail location, subject to the terms and restrictions of the card issuer. The ARV for each Grand Prize is $137.00; the total ARV for all Grand Prizes is $1,370.00. First Prizes (150): One hundred fifty (150) first prizes (each a “First Prize”, collectively the “First Prizes”) are available to be awarded in this Sweepstakes. Each First Prize consists of one (1) gift card which can be redeemed for a Fifteen Dollar ($15.00) purchase at a Family Dollar retail location, subject to the terms and restrictions of the card issuer. The ARV for each First Prize is $15.00; the total ARV for all First Prizes is $2,250.00.